<div class="leading-<?php echo $leadingcount; ?><?php echo $item->state == 0 ? ' system-unpublished' : null; ?>"
Notice how after leading-6 the remaining articles are displaying OUTSIDE of the 'blog' and 'items-leading' divs. Now I thought I was going crazy cause looking at the over ride it doesn't seem like it should do that. 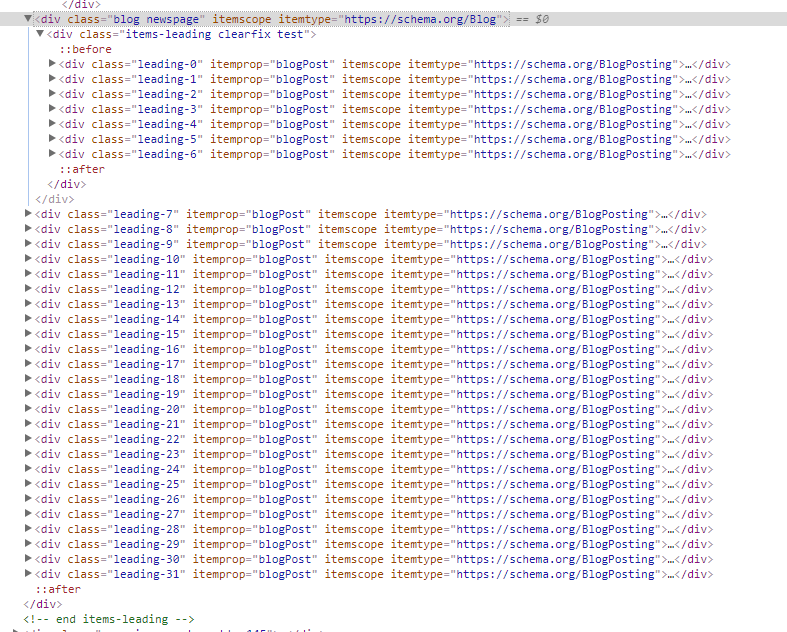 Basically I'm trying to understand why the code looks like every leading article SHOULD be inside the 'items-leading' class but most of them are not (notice how < end items-leading -> appears on the code and on the output HTML, and notice where the 'items-leading' div is on the joomla over ride). So heads up for anyone one that runs into the same issue, just check to see if there's a missing div tag where the category blog is breaking. Not the answer you're looking for? Browse other questions tagged overrides template-override category-blog mod-articles-category or ask your own question. Module Articles Category: How to group articles and order by category order? Blog page showing Categories and their Articles in blocks? How to list a Category Blog and sub-categories with Articles still in Category Blog layout?